Coincidentally, we got our ten-year US visas on the same day that I had decided to make these Chinese style noodles, favourite with the Indians; named as an American dish, but in America it is served only in the Indian restaurants. And to talk of the Chinese, I don’t think they even know about this one! But the crispy fried noodles, with lots of vegetables, and a thick sauce essentially made of tomato ketchup and soy sauce is a favorite “Chinese food” in Mumbai. Especially for families with kids, because of its sweet and sour, but not too spicy preparation. 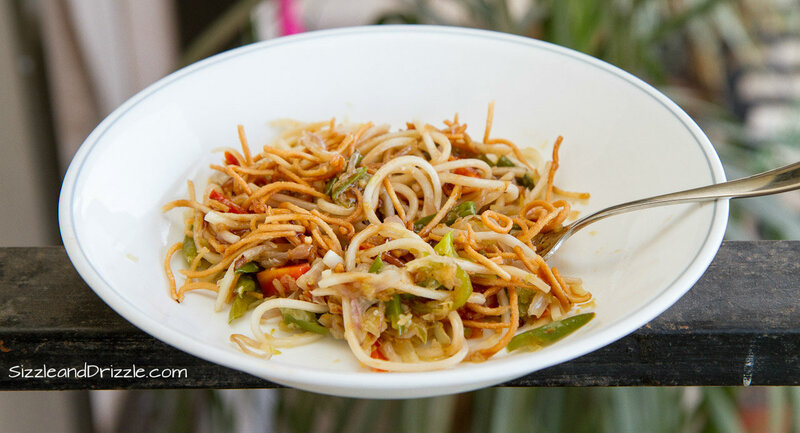 Whenever we went to any restaurant when we were little, my spice-phobic brother (who would add sugar to even a panipuri), would always order American chopsuey. That is also perhaps the same reason why my father-in-law reminisces about this dish. He must have had to eat it several times when his sons were kids. Nutrition-wise the refined flour noodles don’t provide anything except carbohydrates, but top it up with a lot of vegetables and it does make for a good meal. There are 3 steps to make this. I have adapted this recipe from Sanjeev Kapoor’s Khana Khazana. 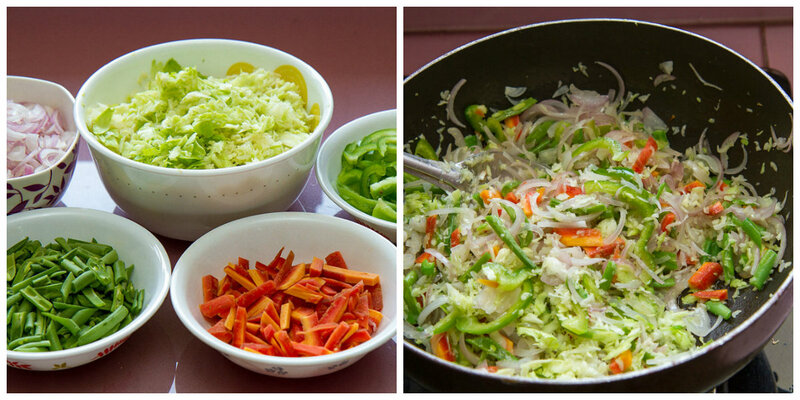 First, slicing and dicing the vegetables and sauteing them. Second, boiling and then deep-frying the noodles.